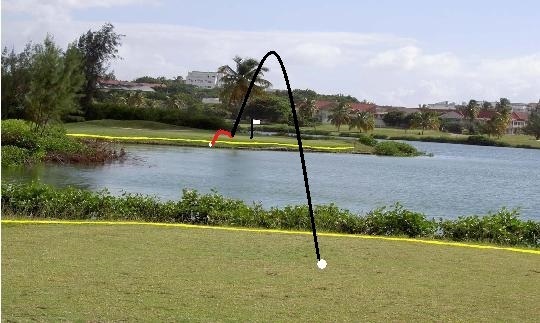 Question: My ball landed on the putting green side of a pond in front of the green, but bounced (See red line below) and came to rest below the yellow hazard line as shown in the picture. From what position do I play my next shot? Answer: This situation is very much like our Panther's Run No.4 hole. You have 3 options for where you play your next shot. We will discuss Options 2 and 3 in the next situation. However, in this situation, Option 1 makes the most sense. Option 1: play the ball as it lies in the hazard with no penalty stroke. However, do not ground the club until you hit the ball. If you do, it's a two-stroke penalty. Question. 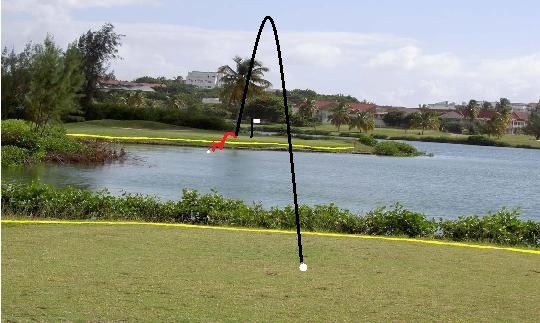 My ball landed on the putting green side of a pond in front of the green, but bounced (See red lines below) and then rolled back into the pond as shown in the picture. Where do I drop a ball to play my next shot? 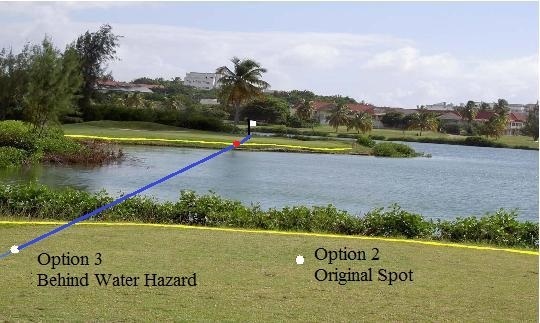 Answer: Since it is certain that the ball is in the water hazard defined by yellow lines and it is impossible to proceed using Option 1 (Play the ball as it lies), we look to Option 2 or Option 3 to determine where to drop a ball for our next shot. Note 1: The position of the drop for Option 3 is related to the position of the hole and the spot where the ball last crossed the margin of the hazard and NOT the position of the original shot or the line of flight of the original shot. Note 2: When proceeding under Option 2 or Option 3 , the player may lift and clean the ball or substitute a ball.